I was working on a post (about school and other shootings) and wanted to check one fact. Result: a couple days of work later, I have found out something really odd about murder in America. I'm nothing of an expert in the field, so I'm hoping that someone who *does* know about it can come along and say what the experts think is going on -- or if I've noticed something that the experts haven't. 1. 30-40 years ago (and possibly earlier), it was almost as common for American men to be killed by their partners as for women. This is extremely unusual: in other countries and cultures, the rate of IPH for women is two to four times that for men. a. Since then, the US pattern has changed, so that nowadays many more women are victims of IPH than men are. Note on the charts: All data in this post are taken from Homicide Trends in the U.S. from the Bureau of Justice Statistics, especially the section on Intimate homicide. Charts with a gray background and yellow margin are taken directly from the BJS report, while those with a white background were created by me based on BJS data. Let me know if I need to show my work in GoogleDocs. The fall in the number of Intimate Partner Homicides, by gender of victim. b. This is almost entirely due to a change in IPH among black Americans. The high American rate of husband-and-boyfriend killing was largely a black phenomenon. Since the 70s, the death rate for black men due to IPH has plummeted, faster than the drop in IPH for black women. Rate of Intimate Partner Homicide, by race and relationship type. Earlier, I had summed the spouse + x-friend rates for each gender, having overlooked that the rates were calculated using different base populations. You're probably going to come across coverage of Ogi Ogas and Sai Gaddam's book A Billion Wicked Thoughts: What the World's Largest Experiment Reveals about Human Desire, released this week. the whole thing unfolds something like a live action version of the phenomenon Justin Kruger and David Dunning discuss in their “Unskilled and Unaware of It: How Difficulties in Recognizing One’s Own Incompetence Lead to Inflated Self-Assessments”. I had a front-row seat. The Friends of Genre Convention (FOGcon) is a literary-themed San Francisco SF/F con in the tradition of Wiscon and Readercon. Each year we’ll focus on a new theme in speculative fiction and invite Honored Guests ranging from writers to scientists to artists. We will build community, exchange ideas, and share our love for the literature of imagination. Whether a glass-edged utopia or a steampunk hell, the city plays a central role in many works of speculative fiction. It can be an arena for conflicts between cultures, a center of learning or vice, a court of power and corruption. In its gutters and government buildings, the city reveals the values a society claims and those it actually honors. Because the city is open to everyone, it’s a place where new things can happen. No wonder it is such a rich topic for so many writers. Lots of other kewl people will be there. There will be programming! My name is Gary Farber. You killed my father. Some of you are familiar with me, and some are not. I'm the FNG as an Obsidian Wings front-page blogger. My first appearance at Obsidian Wings was via a post by Katherine R. on December 16th, 2003, when she linked to a post of mine, and named it Post Of The Week. This attracted my attention to Obsidian Wings, with its first set of bloggers, Moe Lane, Katherine R, and Von. Set the Wayback Machine, Sherman! By guest poster Gary Farber. I don't have one of those. Sorry. But, hey, it's Labor Day weekend, and so a post of silly or unusual links, and open-threadedness for all! This first one you just have to trust me on: A Periodic Table Of Visualization Methods. This sounds incredibly dull, but is immensely cool. Check out the interactivity that a screen shot could barely hint at. How about an actually useful Table Of Condiments and their spoilage? The Periodic Table Of Candy. 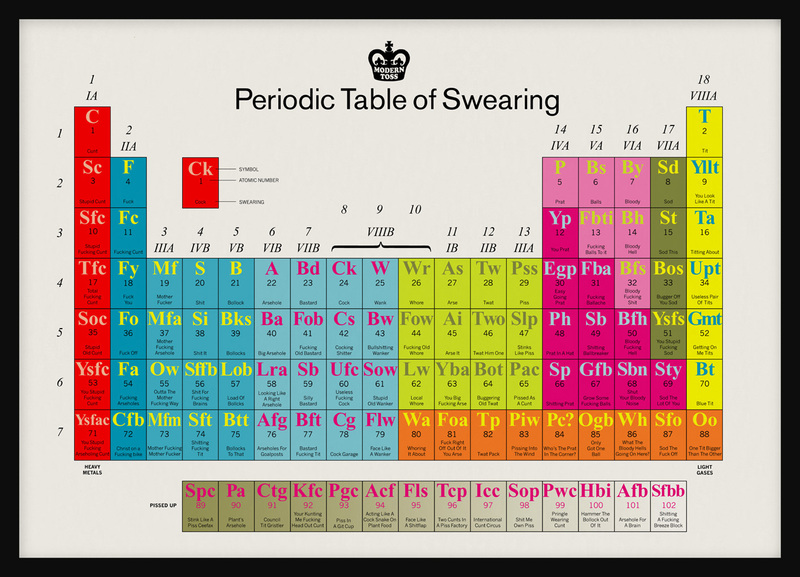 The Periodic Table Of Awesoments. (Hey, it's not my title.) The Periodic Table Of Rejected Elements. And finally, The Wooden Periodic Table Table. But we need more visualizations! A metrocontextual science map (original here), which is to say, in the form of a London Underground map. As I think I've written before, Andy Olmsted's parents have collected his Rocky Mountain blog posts from Iraq into a book. If you'd like to order it, it's now available at 1-800-882-3273. Andy's parents will use any money they make above the production costs to establish a scholarship in his name at St. John's Academy in Shrewsbury, Massachusetts, where Andy went to school.